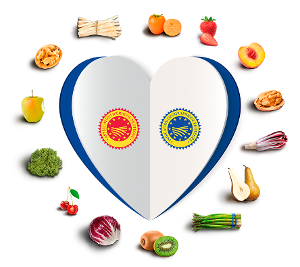 PDO and PGI products represent the excellence of European agricultural food production, and are both the result of a unique combination of human and environmental factors that are characteristic of a specific territory. This is why the European Union dictates precise regulations for their protection, creating specific quality standard regimes that protect the good faith of the consumers and with the purpose of giving producers concrete instruments for identifying and promoting products with specific characteristics in a better way, as well as protecting them from unfair practices. The label PDO (Protected Designation of Origin) identifies a product that originates in a specific place, region or country, the quality or characteristics of which are essentially or exclusively due to a particular geographical environment with its inherent natural factors (raw materials, environmental characteristics, location) and human factors (traditional and craft production) and the production, transformation and elaboration phases of which all take place in the defined geographical area, in respect of rigid production regulations established in the procedural guidelines of production. The label PGI (Protected Geographical Indication) indicates a product that originates in a specific place, region or country, whose given quality, reputation or other characteristics are essentially attributable to its geographical origin, and for which at least one of the production steps takes place in the defined geographical area. Only those production processes that demonstrate a consolidated and coded production tradition, an inseparable bond with the territory of origin, a suitable social-business fabric and which manage to reach high quality standards that are certified by third party control organisations can hope to obtain and preserve the coveted recognition of the community and contemporary entrance into the European register of PDO and PGI products. Because it offers consumers the guarantee that typical, authentic and quality products are being bought, which are part of the food heritage of the European Union Countries. Because it enhances the work of the producers, thanks to the creation of an additional value that protects those same producers against imitations, forgeries and unfair competition. Because it encourages the maintenance and development of the territories, local economy and agricultural and food differences.